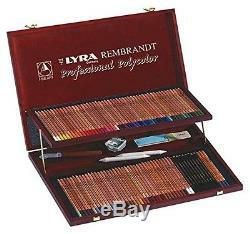 LYRA Rembrandt Polycolor Art Pencils, Set of 105 Pencils Plus Accessories, Assorted Colors (2004200). LYRA Rembrandt artist supplies are superior products for serious artists. LYRA Rembrandt Polycolor Pencils are top quality pencils for artists, graphic artists, designers and architects. With an assortment of 100 colors, Polycolor Pencils allow the user to fully explore his or her creativity. This outstanding selection offers 68 assorted Polycolor Colored Pencils, 10 Polycolor Grey Shades, and 22 Rembrandt Drawing Pencils, plus a kneadable eraser, 2 paper wipers, 1 knife, and a sandpaper block. With a wide color range, these pencils allow you to express any color desired, from strong, full tones to the most delicate nuances. The brilliance, light fastness, water resistance, and particular smoothness of the leads meet even the highest demands. Rembrandt Polycolor artists' pencils enable the user to achieve fine, exact contours, as well as brilliantly colored areas and delicate merges. Apart from use on paper and cardboard, the colors can also be applied to synthetic materials, wood, and textiles. Draw, sketch design and empower your creativity with artist products from LYRA. Use for graphics, design and art. Set includes 100 pencils, kneadable eraser, 2 paper wipers, 1 knife, 1 sandpaper block. Can be applied to paper, cardboard, synthetic materials, wood, and textiles. Product Dimensions: Width: 12.76 Length: 19.13 Height: 1.18. Do not only look at the photo of the item as the details are most accurate. Look at all of the details in the description. Check all dimensions that are important for the item. What began as a home based business has turned into a country wide offering of great products. As we have progressed in growing our business and expanding our upright business practices, we continue to work very hard to make each and every one of our customers smiling with a great experience. We love to hear from our customers and provide open communication if you need help finding the right item or need something that we might not have published yet as a product. If the item is truly a defective item, please make sure to mark it as a return for factory defects as the reason. Once received and confirmed as defective, please allow us a week to complete the processing on end. You have 30 days from the order date to complete your return to make 100% sure it will be covered in our policy. We desire that every customer is happy, so if you have any problems, make sure to reach out to us for a quick resolution that works for both parties. We guarantee your happiness with your item. As we run our store, we place our priorities with making sure that you are satisfied. Providing excellent support and service is important to everyone, and that is no different with us! In order to support you, our most prized customers, we work hard to keep our feedback excellent. Having excellent feedback shows that if you need help, we are here for you. Upon any messages received by our customers, you will experience our fast paced and happy support team that works around the clock. By purchasing this item you agree to the terms and conditions stated above. The item "Lyra LYRA Rembrandt Polycolor Art Pencils, Set of 105 Pencils Plus Accessories" is in sale since Sunday, March 19, 2017. This item is in the category "Crafts\Art Supplies\Drawing & Lettering Supplies\Art Pencils & Charcoal". The seller is "blowoutbuy" and is located in USA. This item can be shipped to United States, to Canada, to United Kingdom, DK, RO, SK, BG, CZ, FI, HU, LV, LT, MT, EE, to Australia, GR, PT, CY, SI, to Japan, to China, SE, KR, ID, to Taiwan, ZA, TH, to Belgium, to France, to Hong Kong, to Ireland, to Netherlands, PL, to Spain, to Italy, to Germany, to Austria, RU, IL, to Mexico, to New Zealand, PH, SG, to Switzerland, NO, SA, UA, AE, QA, KW, BH, HR, MY, BR, CL, CO, CR, PA, TT, GT, HN, JM.